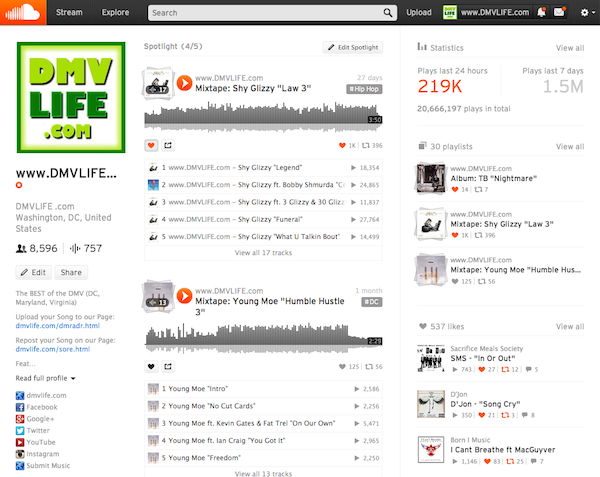 Add your mixtape to the DMVLIFE Soundcloud page! We will feature your entire mixtape on our Soundcloud page. Visitors will be able to listen or download the entire mixtape or individual tracks. We will also feature your mixtape on DMVLIFE.com in the "Top DMV Mixtapes" section, featured in the "DMV News" section, and listed at the bottom of the Home Page of DMVLIFE.com for a few days. Make the payment and your mixtape will be added within 48 hours. Send your mixtape and artwork to: Mixtape@dmvlife.com. We will notify you once your mixtape has been added to DMVLIFE.com.